Vegetable smoothies offer a lot of healthy nutrients and are as delicious as fruit-flavored beverages. Experts recommend consuming about four to five servings of fruits and vegetables each day. Besides the high nutritional value, this article introduces some recipes for vegetable smoothies. Depending on the ingredients and sugar content of the vegetable smoothie, the number of calories of your beverage can range from 60 to 140 per glass (8 ounces). To reduce the calorie content, make your own vegetable smoothie, using more vegetables and less fruits or sugar additives. People need to take an adequate amount of fiber in their diet for good digestion, proper waste elimination and healthy weight maintenance. However, a vegetable smoothie may contain as little as 0-3 grams of fiber only, so you need to take more whole fruits and vegetables as part of a healthy diet to reduce your risk for obesity, diabetes and heart disease. A vegetable smoothie may contain zero fat, 14-35 grams of carbohydrates, and 1-2 grams of protein, depending on the ingredients. Taking vegetable smoothies may be healthy but remember that you need 20-35% of your daily calories from fat, 45-65% from carbohydrates, and 10-35% of from protein. Pureed vegetables and fruits are a good source of vitamins and minerals. An 8-oz. serving of vegetable smoothie contains many vitamins and minerals, including vitamin A (120% of your daily value), vitamin C (105% DV), and iron (25% DV). 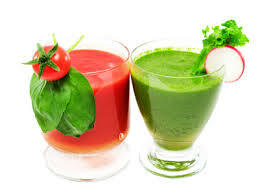 Vegetable smoothies contain significantly lower sodium than vegetable juices. A homemade vegetable smoothie contains about 7.5 mg of sodium, while a bottled vegetable smoothie contains 25 mg sodium. In comparison, vegetable juices may contain as much as 600 mg sodium. Here are some ideas for making your own vegetable smoothie. It is easy to make – just combine these ingredients and blend for one minute till smooth. Benefit. Make a fiery red cabbage smoothie with the sweetness and flavor of cinnamon and honey. Ingredients. ½ c orange juice, freshly squeezed; ½ c chopped red cabbage; 1 c frozen cherries; 1/8 tsp cinnamon; 1 tsp honey; ice cubes. For topping, add fresh granola. Benefit. Enjoy this vegetable smoothie with a kick of fresh salsa. Ingredients. 2 tbsp lemon juice; ¼ c orange juice, freshly squeezed; ½ c finely chopped broccoli; ½ c spinach, chopped, 1 tomato, chopped; 1 tbsp sunflower seeds (raw); ¼ c fresh salsa; ice cubes. Garnish with sliced lemon. Benefit. Arugula and apples are power-packed health foods that are delicious when combined. Ingredients. ½ c orange juice, freshly squeezed; 1 c packed arugula; 1 tbsp walnuts or pecans; ½ apple, peeled and cored; ¼ c yogurt or coconut milk; ice cubes. Garnish with an apple slice. Benefit. This vegetable smoothie combines the healthy nutrients of carrots and the sweet flavor of fall spices. Ingredients: ¼ c apple sauce; ½ c apple juice; 1 c cooked carrots, chopped; ¼ tsp ground cinnamon; ¼ c yogurt or coconut milk; 1/8 tsp cayenne pepper; ice cubes. Top with a sprinkle of cinnamon. Benefit. Make a pretty purple smoothie that provides antioxidants and add some flax seed for more nutrients. Ingredients. ½ c orange juice freshly squeezed; 1 c blueberries, fresh or frozen; 1/3 c beet, diced; ¼ c plain yogurt (low fat), 1 tbsp ground flax seed; ice cubes. Place a slice of orange to garnish.